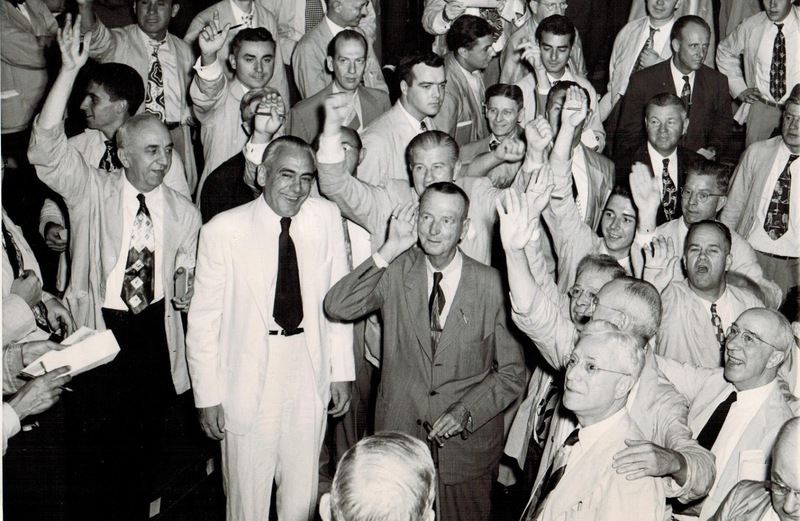 The exchanges always made a tradition of inviting military officers to the trading floor and pictured above is when the CBOT was honored to host General Jonathan Wainwright in 1949. General Wainwright was the commander of Allied forces in the Philippines and surrendered to Japan at Corregidor due to overwhelming circumstances. If any of you visit the Philippines, I highly reccomend a visit to Corregidor to see the massive fortifications and tunnels which the US and then Japanese built on the island. General Wainwright served as the highest ranking POW in that theatre and subsequently received the Medal of Honor for his service. Upon return to the US he received quite a reception as shown below in the youtube vid but also managed to enjoy a well deserved cigar in the CBOT pits!